Being able to report on your member data and member billing data is essential for an association's day-to-day work. Reporting is needed to get a sense for membership trends, produce reports on your financial condition, as well as export data for mailings and other uses. The system comes with a variety of pre-built member database reports that are easy to run. This includes rosters, calling lists, PDF directories, member count trending, membership retention reports, member engagement reports; and several other reports that are frequently used. Many of the reports necessary for handling member billing and event registration billing are pre-built, and ready-to-go Included are aging reports, member status, paid-thru report, mass invoice printing, mailing label printing, new member report, dropped member report, and many more. For reporting needs not met by the pre-built, canned reports, try our custom reporting module. 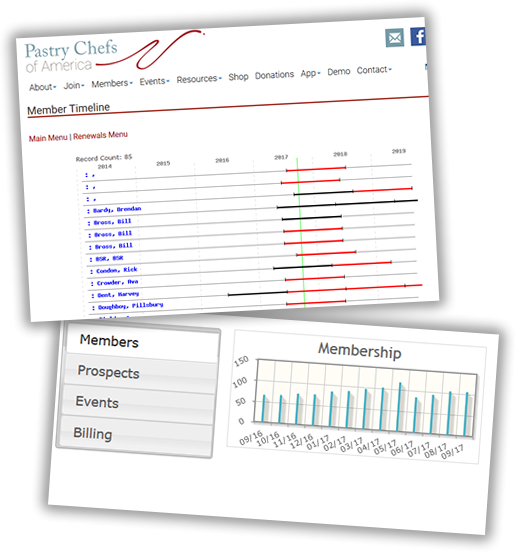 To create a Custom Report you would build a query based on your customized criteria: membership plan, projects/committees, mailing lists, contact information fields, join/drop dates, and any custom fields that have been configured for your association. A sort order can then be applied to determine how the data is sorted in the report. After the query has been built to select the records for the report and a sort order selected, one of many different output types may be selected, including mailing labels, postcards, PDF-formatted reports, custom field-by-field reports (where the user can pick and choose the fields), data export (.csv files), and several other formats.